Cook the Béchamel sauce first as it’s needed for the Mornay sauce. Cook pasta in a separate pot and then sauté in a pan with Mornay sauce. On the side, warm up blanched or cooked lobster in butter. Recipe Courtesy of Robert Noel of DEJA-BU. 1. Melt butter in a thick bottomed pot. 2. Add onions and saute for 2-3 minutes. 3. Add flour and form roux, cook for 2-3 minutes, until light golden colour (not too dark). 4. Add milk 1/3 at a time stirring constantly. 5. Add a stick of lemongrass and let cook for 10-20 minutes or until raw starch taste is gone. 6. Add cream and reduce sauce. 1. In a pot, heat all ingredients until melted. 2. Cook for 4-5 minutes. 2. Add the pasta and cook for 8-10 minutes or until al dente; drain well. 3. 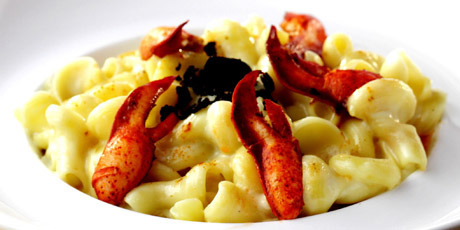 In a pan mix 1 cup of cooked macaroni with ½ cup of Mornay sauce, sauté. 4. In a different pan warm up lobster meat with butter. 5. Place pasta in a serving dish, add a drizzle of white truffle oil and slices of truffle (optional). 6. Put lobster meat and the lobster infused butter from the cooking pan on top of the pasta.